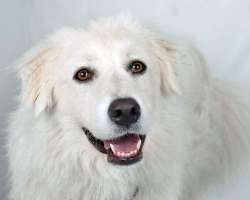 Angel is a 1.5 yr old Great Pyrenees / Golden Retriever mix. She she is a very laid back dog, much like the Pyr, but has the look and some of the features of a Golden. She's not huge, but Golden Retriever sized. She is very sweet and is good with her foster brothers and sisters. She enjoys playing. She has a very full long coat and wants to be adopted in New England and enjoy cooler weather She is starting to get used to car rides and walking on leash as this is all new to her. 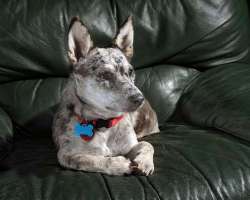 When she was rescued she was living with other dogs and 14 cats. 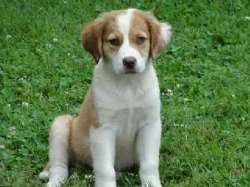 She was fed pinto beans instead of quality dog food so now has been thriving on Fromm dog food and is doing very well. She seems fine around children as you can see in her photo with the groomers daughter. She still tends to be a little nervous indoors and prefers an open door to go in and out. This will pass she has just never been indoors before rescue. She is a very loving sweet girl who will need a patient adopter. She is available to be seen on June 29th and 30th. 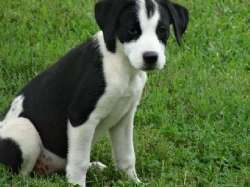 Black Jacks is a 9 month old Retriever mix who looks to have a little bit of Shepherd and possibly some Golden as he has the golden highlights all throughout his coat. He is a VERY smart and VERY playful dog who knows how to open doors. 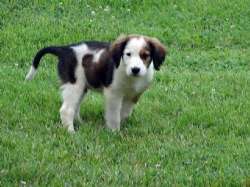 He is service dog potential but would be happy with a family who will engage him and train him. He has great potential! He arrives 6/10/13 and is available after his health exam on 6/13/13. Get your application in quick and if you already have an application on file, please let us know if you would like to meet him. 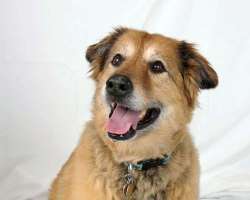 Cali is a 9 year old female spayed Collie mix, a rescued dog whose owner passed away last year and friends took her in. The friends have come on hard times and can no longer keep her so she is in need of a new home. She is a very sweet and quiet dog. 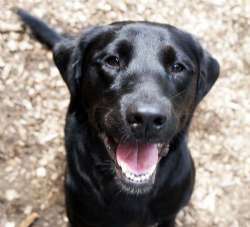 She weighs around 60 lbs, has a wonderful coat, a gentle personality, and she loves attention. She has lived with an large male dog and enjoyed her walks with him. She is quiet in the house and mindful to passerbys. She's not a swimmer, but will sometimes put her feet in. She has the long, thick coat of a Golden. She is good with kids, fine with dogs, but will ignore most dogs. She's not interested in playing with dogs, but more just wants to sit on the sofa with her people. She would love a stay-at-home person where she hang out and then go for a leisurely walk with you. 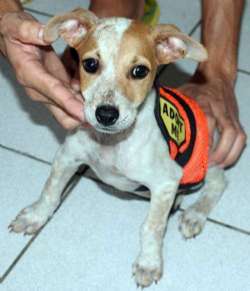 Please fill out the online application at www.saveadog.org as that will help to speed the process. 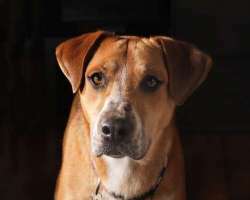 Farley is a 1.5 year old big mutt of a dog who seems to have some of these breeds in him: Boxer/Lab/Shepherd/Dane mix -- he is a really fun loving dog. You should see him play with his toys. He will play with them for hours. He's neutered and up to date on his vaccines. He is just a big puppy and a really good natured dog. He loves everyone he meets and he he has no issues. He's tall and lanky and loves to run around, but also likes to lounge around inside. He's a very smart dog. He just went into foster care after the 4th and his foster mom writes: When I first brought him inside, he couldn't stop wagging that tail for a long time. He seemed to be saying "FINALLY I'm in a real house". We took a couple of shorter walks and then he settled down. He thinks he's a lap dog, and was stretched out with his head on my husband's lap. He's completely submissive to my female dog. He slept in his crate all night without a peep. He also seems house broken. He's good on leash. Probably shouldn't go with cats as he is too interested in them. When you meet him you will look into his eyes and see into his heart! What a nice dog! Get a jump on the process by filling out the application online and then come to the shelter during our Meet-and-Greet hours. 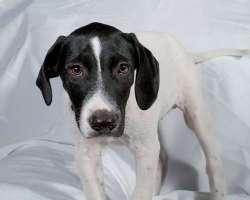 Judd is a 19 month old Collie/Hound mix who is available for adoption. He came in with buck shot wounds on his back, but is recovering nicely. Judd is the most affectionate, sweet dog you will ever meet. Judd and his littermate, Bear, came from the same WV home where they stayed with their mom, Sheeba. They have always been together. Their owner had to work long hours so Judd and Bear got bored and dug out of the back yard and were subsequently shot at. These friendly dogs were saved in the nick of time. Once Judd recovers we will be looking for the best home as he really deserves it. He is the most gentle, sweet dog who loves nothing more than to put his head in your lap. Judd weighs 54 lbs! He is well worth adopting! Leroy was rescued along with his litter mates from rural TN. This litter of puppies were abandoned at 5 weeks of age by their owners. There are both males and females in the litter. The owners moved away and took everything, even their mobile home, but they left 7 puppies under a camper shell. The shelter called me asking if our rescue partners if they would go get them after the neighbor called about the puppies. The shelter did not want such young puppies coming to the shelter so they have been in foster care for over 4 weeks! Foster mom says a neighbor reported hearing the pups crying in the night. When I got there at the site there was nothing left except piles of trash and 7 puppies under a camper shell scared and hungry. They are the sweetest and most loving little puppies that would all love to have their very own home. They love attention and to be held and cuddled. They do scratch, nip and jump up as all pups do, but we will start working with them as soon as they arrive and they will be wonderful additions to your home. Please apply if you're interested and watch for our shelter hours. 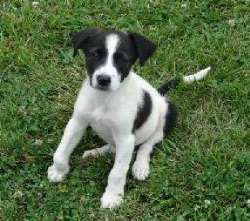 Lester is from rural TN and was rescued along with his litter mates. This litter of puppies were abandoned at 5 weeks of age by their owners. There are both males and females in the litter. The owners moved away and took everything, even their mobile home, but they left 7 puppies under a camper shell. The shelter called me asking if our rescue partners if they would go get them after the neighbor called about the puppies. The shelter did not want such young puppies coming to the shelter so they have been in foster care for over 4 weeks! Foster mom says a neighbor reported hearing the pups crying in the night. When I got there at the site there was nothing left except piles of trash and 7 puppies under a camper shell scared and hungry. They are the sweetest and most loving little puppies that would all love to have their very own home. They love attention and to be held and cuddled. They do scratch, nip and jump up as all pups do, but we will start working with them as soon as they arrive and they will be wonderful additions to your home. Please apply if you're interested and watch for our shelter hours. Levi was rescued along with his litter mates from rural TN. He is the smallest pup in the litter. This litter of puppies were abandoned at 5 weeks of age by their owners. There are both males and females in the litter. The owners moved away and took everything, even their mobile home, but they left 7 puppies under a camper shell. The shelter called me asking if our rescue partners if they would go get them after the neighbor called about the puppies. The shelter did not want such young puppies coming to the shelter so they have been in foster care for over 4 weeks! Foster mom says a neighbor reported hearing the pups crying in the night. When I got there at the site there was nothing left except piles of trash and 7 puppies under a camper shell scared and hungry. They are the sweetest and most loving little puppies that would all love to have their very own home. They love attention and to be held and cuddled. They do scratch, nip and jump up as all pups do, but we will start working with them as soon as they arrive and they will be wonderful additions to your home. Please apply if you're interested and watch for our shelter hours. Lloyd was rescued along with his litter mates from rural TN. This litter of puppies were abandoned at 5 weeks of age by their owners. There are both males and females in the litter. The owners moved away and took everything, even their mobile home, but they left 7 puppies under a camper shell. The shelter called me asking if our rescue partners if they would go get them after the neighbor called about the puppies. The shelter did not want such young puppies coming to the shelter so they have been in foster care for over 4 weeks! Foster mom says a neighbor reported hearing the pups crying in the night. When I got there at the site there was nothing left except piles of trash and 7 puppies under a camper shell scared and hungry. They are the sweetest and most loving little puppies that would all love to have their very own home. They love attention and to be held and cuddled. They do scratch, nip and jump up as all pups do, but we will start working with them as soon as they arrive and they will be wonderful additions to your home. Please apply if you're interested and watch for our shelter hours. Lotty was rescued along with her litter mates from rural TN. This litter of puppies were abandoned at 5 weeks of age by their owners. There are both males and females in the litter. The owners moved away and took everything, even their mobile home, but they left 7 puppies under a camper shell. The shelter called me asking if our rescue partners if they would go get them after the neighbor called about the puppies. The shelter did not want such young puppies coming to the shelter so they have been in foster care for over 4 weeks! Foster mom says a neighbor reported hearing the pups crying in the night. When I got there at the site there was nothing left except piles of trash and 7 puppies under a camper shell scared and hungry. They are the sweetest and most loving little puppies that would all love to have their very own home. They love attention and to be held and cuddled. They do scratch, nip and jump up as all pups do, but we will start working with them as soon as they arrive and they will be wonderful additions to your home. Please apply if you're interested and watch for our shelter hours. Lulu was rescued along with her litter mates from rural TN. This litter of puppies were abandoned at 5 weeks of age by their owners. There are both males and females in the litter. The owners moved away and took everything, even their mobile home, but they left 7 puppies under a camper shell. The shelter called me asking if our rescue partners if they would go get them after the neighbor called about the puppies. The shelter did not want such young puppies coming to the shelter so they have been in foster care for over 4 weeks! Foster mom says a neighbor reported hearing the pups crying in the night. When I got there at the site there was nothing left except piles of trash and 7 puppies under a camper shell scared and hungry. They are the sweetest and most loving little puppies that would all love to have their very own home. They love attention and to be held and cuddled. They do scratch, nip and jump up as all pups do, but we will start working with them as soon as they arrive and they will be wonderful additions to your home. Please apply if you're interested and watch for our shelter hours. 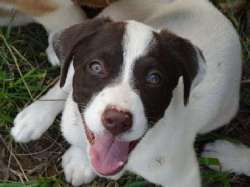 Lyle is a small male Aussie/Colile pup who was rescued along with his litter mates from rural TN. This litter of puppies were abandoned at 5 weeks of age by their owners. There are both males and females in the litter. The owners moved away and took everything, even their mobile home, but they left 7 puppies under a camper shell. The shelter called me asking if our rescue partners if they would go get them after the neighbor called about the puppies. The shelter did not want such young puppies coming to the shelter so they have been in foster care for over 4 weeks! Foster mom says a neighbor reported hearing the pups crying in the night. When I got there at the site there was nothing left except piles of trash and 7 puppies under a camper shell scared and hungry. They are the sweetest and most loving little puppies that would all love to have their very own home. They love attention and to be held and cuddled. They do scratch, nip and jump up as all pups do, but we will start working with them as soon as they arrive and they will be wonderful additions to your home. Please apply if you're interested and watch for our shelter hours. He will need a stay at home situation. 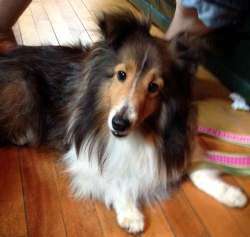 Missy is a 6, almost 7 year old very petite Sheltie who needs a human who is not going to give up on her. Her first owner(a woman) passed away from Cancer and she been passed on ever since, having 4 or 5 owners, mostly people who took her without realizing that dogs need time and attention. She is a very loving dog and a fairly easy keeper, except right now she is being treated for sarcoptic mange. She has been punished for going the bathroom in the house so will need a positive-minded adopter who will love on her. She also need an adopter who is holistically minded as we're using a holistic protocol with her diet and meds. She's a precious girl who just wants love. Someone who is home most of the day would be ideal to make sure she gets enough love and attention and bathroom breaks. She's totally sweet. She was not raised with children so it's best if we place her in an adult home. Visiting children are fine. She's fine with other dogs and cats, but needs to be an only pet for now as the mange is the contagious-to-pets kind. 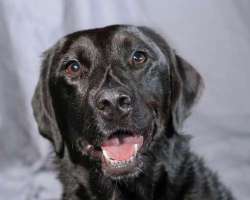 Sassy is a beautiful black Lab mix who is a new arrival. She weighs 44 lbs so is a nice size for a Lab. Her sister is Sweetie. She is currently being evaluated and will be available after 7/26/13. She knows Sit, but she still jumps up out of excitement. She will come when called but not if busy playing with other dogs and she will chase a ball. She is good with cats! Please apply online if you are interested in meeting her or come to one of our shelter visiting days that we call Meet and Greet the Dogs. We are usually open on Saturdays and Sundays from 12-3. Check home page for any changes in hours. 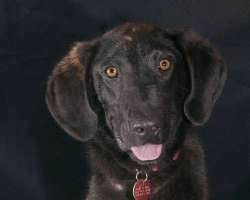 Sweetie is a beautiful black Lax mix who is a new arrival. Her sister is Sassy. Sweetie weighs 47 lbs. so is a nice size for a Lab. We don't see any other breed in her, but she's slender and petite. She is just a hair taller than her sister. She is available after 7/26/13. She knows Sit, but she still jumps up out of excitement. She will chase a ball and is a little calmer than her sister. She's good with cats and dogs. Please apply online if you are interested in meeting her or come to one of our shelter visiting days that we call Meet and Greet the Dogs. We are usually open on Saturdays and Sundays from 12-3. Check home page for any changes in hours. Meet Tuukka. Have you ever seen a more beautiful face? He's about 4 or 5 months old, is house trained if you get him out often. At times he will hold his water for long periods of time. 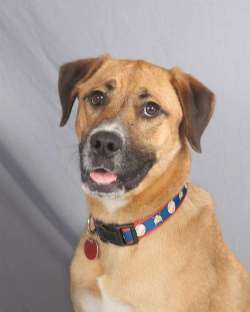 Tuukka is a laid back pup who likes to lay around and not waste his energy. He is not lazy but conservative. He was dumped at a Walmart in TN along with Torey. We're not sure if they're siblings or not, but they had only each other and to this day are very close pals even though they don't need to worry about things anymore. They like to look out for one another. 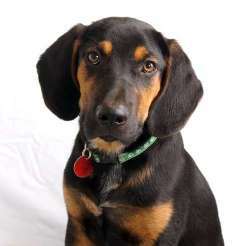 Tuukka weighs 31 lbs and is has some hound in him, very obviously, but is very quiet. He loves to be pet and probably had a history of some abuse as he can be head shy (although many hounds are). His feet are big but his legs are short so he could have Bassett in him. We would love a gentle adopter for him. He is housebroken and gets along with kids. He likes to sleep in the crate and has never torn up anything in his foster home. He will need to be shown that the world is a fun place and he won't be hurt. He would do well with another dog to continue modeling confident behavior. He is arriving on 6/24 and will be available after 6/26. Please apply online if you're interested in adopting. If you miss out on this puppy, we will save your application for another as long as you meet our guidelines for adopting puppies (they need someone who is home during the day or part time workers). 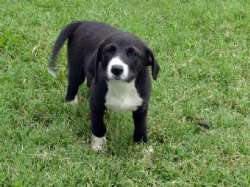 Meet Witty, a 10 week old male pup who will be available for adoption after the 4th of July. What a cutie! He's a very lively little puppy, always wanting to play. He follows you everywhere and chases the other puppies. When you pick him up and hold him he's very gentle and just loves cuddles and giving kisses. Puppies need someone home during the day, so 1 or 2 hours alone would be okay, but not more. He was given up because his owner had too many dogs. Applicants who fill out the application ahead of time and who are the best fit for her are given preference.